I’m asking you all to make your voice heard. If you want a balanced approach to reducing the deficit, let your Member of Congress know. If you believe we can solve this problem through compromise, send that message. very well either. I could figure out what he meant because I follow this stuff, but I’m not sure someone who was coming into this cold could have. And Boehner! What kind of gall does it take to describe last week’s House bill as “bipartisan”? How many Dems voted for it? Three? Four? And he repeated this nonsense multiple times. This was accompanied by claims that it was Obama who created this whole crisis in the first place, that healthcare reform added to the deficit, and that Obama’s “balanced approach” meant solely more spending and more taxes. Ugh. This is about as close to outright lying as you can get without being called on it. But Boehner knows well that it doesn’t matter. If anyone does call him on it, it will only be in a few print-only fact checking pieces that no one reads. 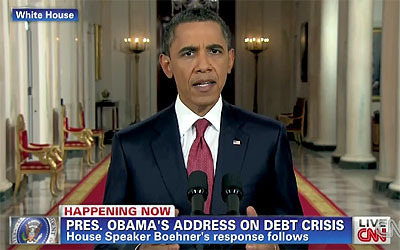 I’m not sure what Obama hoped to accomplish tonight. He didn’t really explain the debt ceiling itself very well, and for my money he didn’t explain the problem with the tea party caucus in the House very well either. The latter, unfortunately, isn’t really something you can explain unless you’re pretty blunt about it, and that’s just not his style. Nor was any news made. I dunno. Maybe I’m misjudging how this will go over with Joe Sixpack. Maybe the congressional switchboard really will light up with demands for compromise. But it sure didn’t seem to me that Obama moved the needle much tonight.